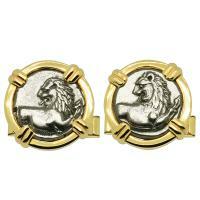 Greek 386-338 BC, Lion hemidrachms in 14k gold cufflinks. 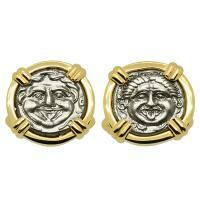 Greek 350-300 BC, Gorgon hemidrachms in 14k gold cufflinks. 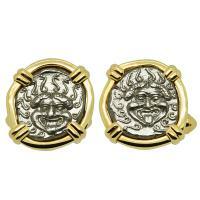 Greek 450-400 BC, Gorgon drachms in 14k gold cufflinks. 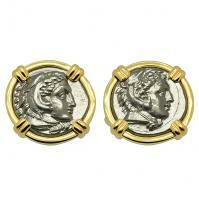 Greek 328-323 BC "Lifetime Issues", Alexander the Great drachms in 14k gold cufflinks. 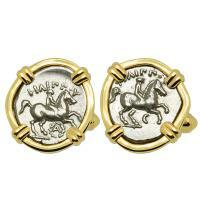 Greek 345-330 BC, King Philip II Horseman & Apollo 1/5 tetradrachms in 14k gold cufflinks. 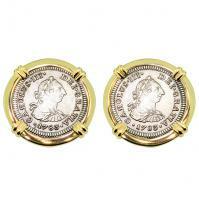 Greek 35-12 BC, King Azes II & Zeus drachms in 14k gold cufflinks. 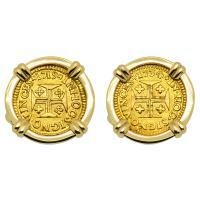 Italian 1139-1252, Crusader Cross denaro in 14k gold cufflinks. 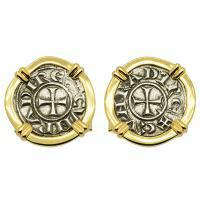 Italian 1139-1252, Crusader Cross denaro in 14k white gold cufflinks. 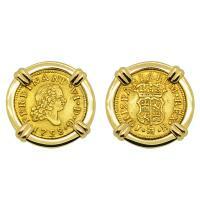 Portuguese 400 Reis dated 1719 & 1734, in 14k gold cufflinks. 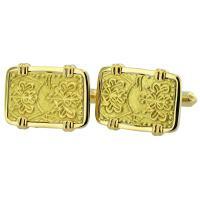 Japanese Shogun 1859-1869 gold nibu-kin in 14k gold cufflinks. 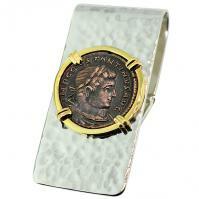 Roman Empire AD 310-317, Constantine the Great follis in 14k gold bezel on silver money clip. 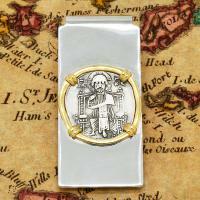 Italian 1139-1252, Crusader Cross denaro in 14k gold bezel on silver money clip. 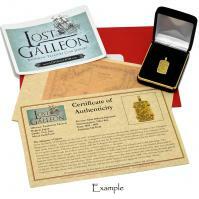 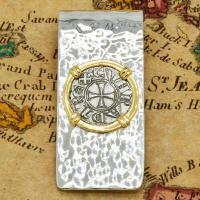 Venetian Republic 1275-1339 grosso in 14k gold bezel on silver money clip.